Healing the spirit of a troubled building; New owners use rituals, rehab to mend Sullivan’s last design. He was the poet of the skyscraper, the coiner of the phrase “form follows function”, the man his draftsman Frank Lloyd Wright called “beloved master”. 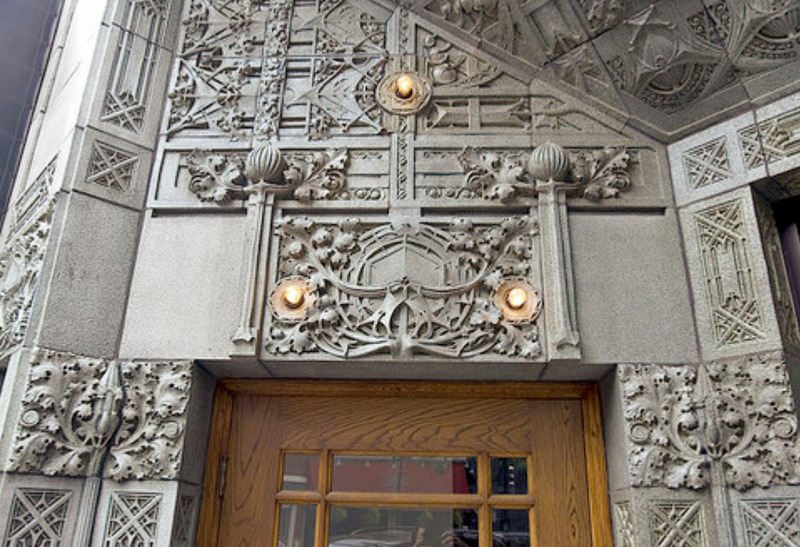 The late, great Chicago architect Louis Sullivan soared to the heights of his profession at the turn of the last century, but died penniless and without work. Last year, as Chicago celebrated the 150th anniversary of his birth, three of his buildings in the city were destroyed or severely damaged by fire. 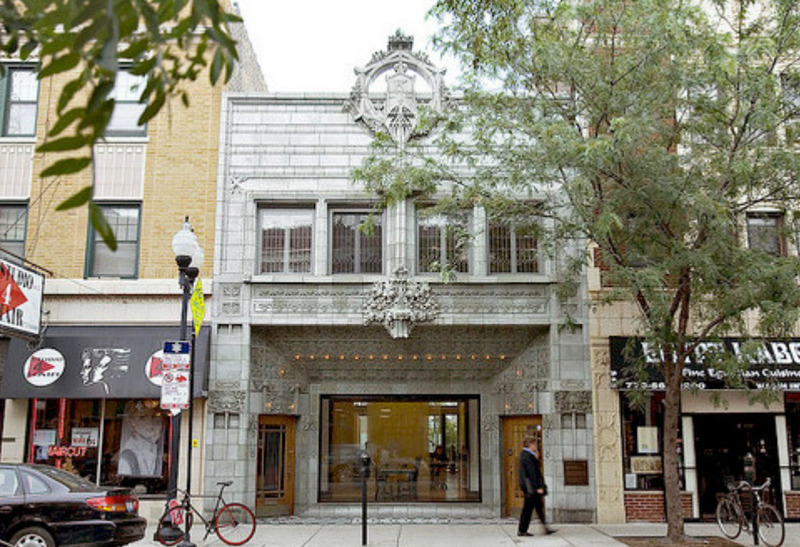 So there is something profoundly satisfying, even healing, about the just completed restoration and reinvention of the last building Sullivan designed before his death in 1924, the Krause Music Store, 4611 N. Lincoln Ave. It’s a beloved little building with an over-the-top facade of pale green terra cotta — and a dark past, its new owners believe, that has finally been exorcised with the help of some unorthodox rituals. A few years after the building opened in 1922, its namesake owner killed himself in his second-floor apartment. 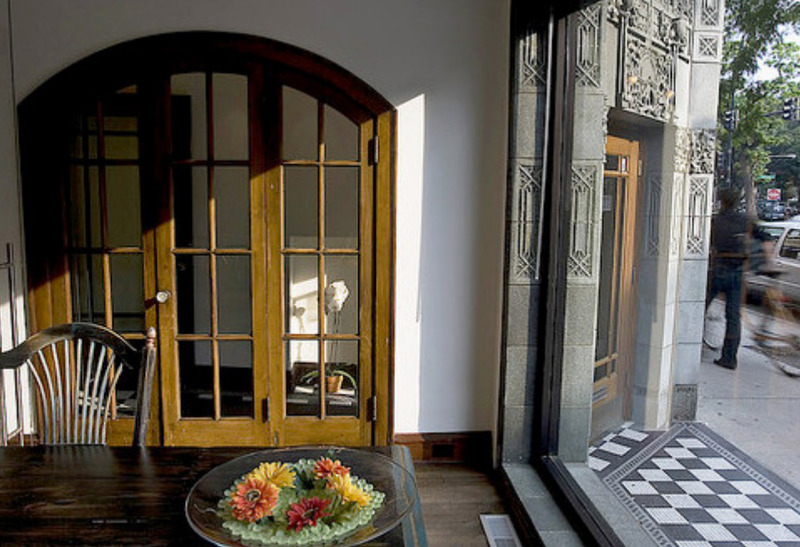 For decades afterward, the architectural gem muddled through life as a funeral home. Bodies were embalmed in the basement, then hoisted up to the first floor chapel by a special casket elevator. Now, thanks to the adventurous owners and two skilled architectural firms, the building has entered a new phase. Its exterior has been handsomely restored. Its interior has been given a fresh modern look that is at once bracingly contemporary and deeply respectful of the original. There are broader lessons here, not only about how the present should engage the past, but also about the role that ritual still plays in the structures where we live, work and play. The transformation of the Krause Music Store only happened after the owners, Peter and Pooja Vukosavich, performed their own acts of spiritual cleansing. They consulted a feng shui master, for example, who told them to drive out the evil spirits by lining the perimeters of each floor with rice and salt, and then letting the lights blaze all night. It was one of our four ceremonies they had at the building. Others involved meditation and bringing in a Hindu priest who burned herbs in a pot. The smoke from the pot was meant to cleanse the space. Kooky? Not any more kooky than the ritual of the “topping-out” ceremony, in which construction workers lay a tree atop a skyscraper completed superstructure. Buildings do more than keep out the rain. They’re vessels for our hopes and dreams. Why not bless them? “I just felt an unhappiness here that had to be taken away.” Pooja Vukosavich, a partner with her husband in Studio V Design, a marketing communications design firm, said. 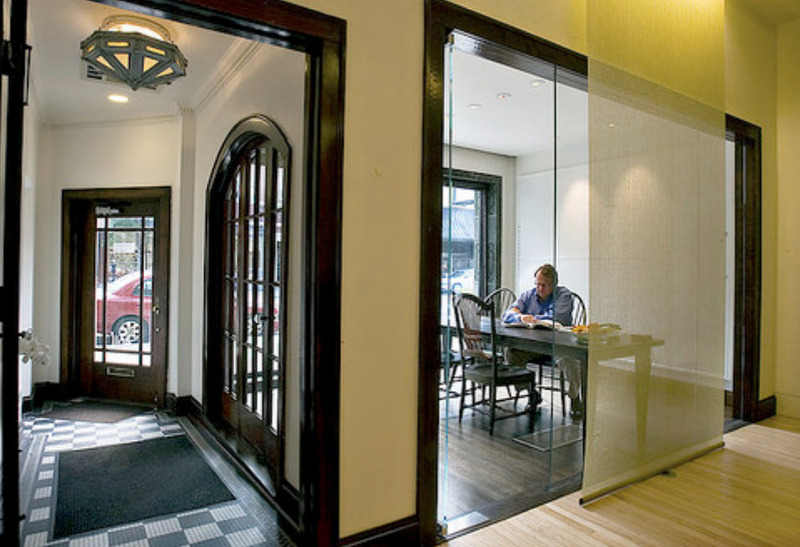 The building’s first floor now serves as the firm’s offices while the second-floor apartment, which has the quirky address of 4611 ½ N. Lincoln, is rented out to a family. An official Chicago landmark that recently listed on the National Register of Historic Places, the Krause Music Store is the smallest building on its block in the thriving Lincoln Square neighborhood, but it has by far the most powerful presence. 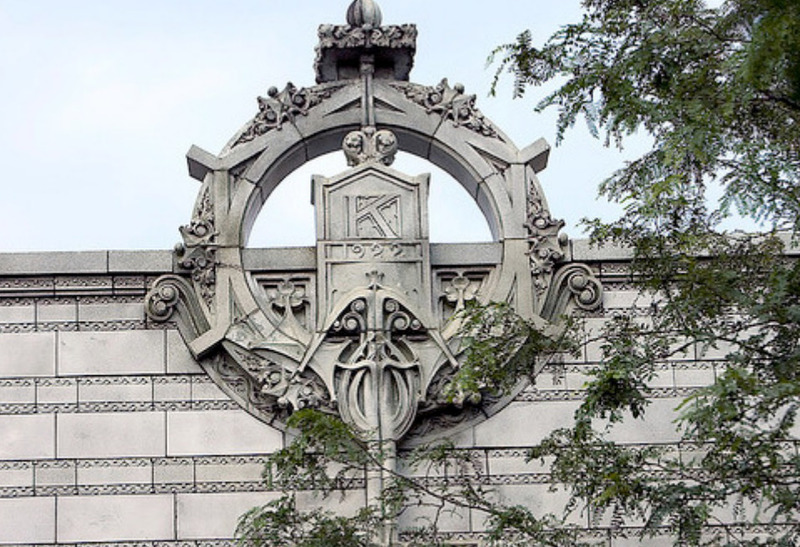 Sullivan gave it this oomph with a deeply recessed entry and, above, an explosion of ornament – an oversize, key-shaped decoration, complete with the letter “K”, which stood for the patron, William Krause. The balance of horizontals and verticals is every bit as effective as Sullivan’s old Carson Pirie Scott & Co. store at State and Madison Streets, but here it bursts beyond the building’s frame, as if Sullivan, who late in his career was restricted to small-scale commissions such as small-town banks, could not contain himself. 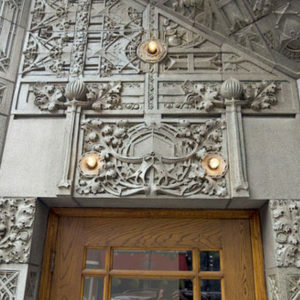 By the early 1920’s ,the architect, who once shaped skyscrapers, grand hotels and concert halls in a nature-inspired, uniquely American design grammar, was practically without work, swept aside by a turn to the historical styles he despised and refused to imitate. It is said, too, that his demise was furthered by heavy drinking. But then Krause asked a neighbor, a little-known architect named William Presto, to design an apartment for the Krause family upstairs and a music showroom below. Presto remembered Sullivan, for whom he had once been a draftsman. He asked Sullivan to design the music showroom facade while he did the rest of the building himself. Sullivan responded with the same mix of aesthetic skill and merchandise cunning he brought to Carson’s and other stores. At the Krause Music Store, the entire experience seemed designed to transport the potential buyer from mundane everyday world into a fantasy realm of music, where the piano was the great object of desire. Like a proscenium arch, the folded planes of the facade’s lower half expertly drew the eye to the store’s showroom window while the exposed light bulbs ringing the windows suggested the threshold of a movie marquee. 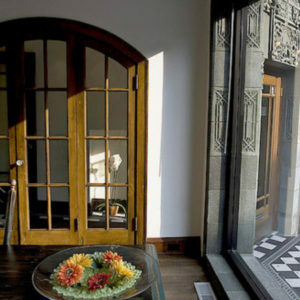 Inside, the potential buyer would see not only first-floor showroom but also, perhaps, the second-floor apartment, where Krause kept a grand piano in an elaborately decorated living room, complete with Tudor style windows. That’s where he would seal the deal. 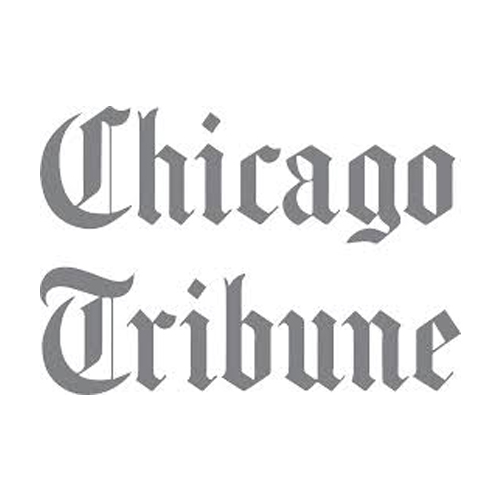 “When people would say, “I don’t know if I could fit a big piano like that in my living room or my home,” Krause would say, “Well you can come up and see it in my own place,” recalled Tim Samuelson, Chicago’s cultural historian and an authority on Sullivan’s life and work. Yet Krause’s prosperity was short lived. He killed himself in his upstairs apartment “some years later”, according to a report by the Commission on Chicago Landmarks from 1977, when Krause Music Store was declared a city landmark. 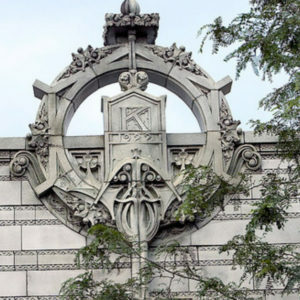 Though Krause’s wife owned the building through 1958, the store became a funeral home in 1929 and remained one for decades until, in recent years, different owner turned it into a gallery and then a decorative art museum and store. The Vukosaviches bought the building in 2005 with the aim of remaking it as an office within walking distance of their home in the West Graceland neighborhood. 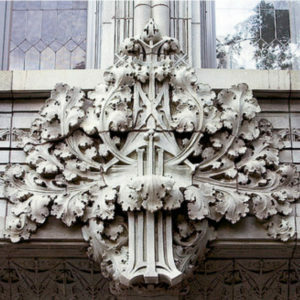 To them, it presented a unique opportunity – a modestly scaled, financially accessible piece of Sullivan’s legacy. Who, after all, can buy a huge building such as a the Carson’s store? The Vukosaviches did not scrimp on the restoration – hiring not one firm, but two (as Krause did) and it shows. 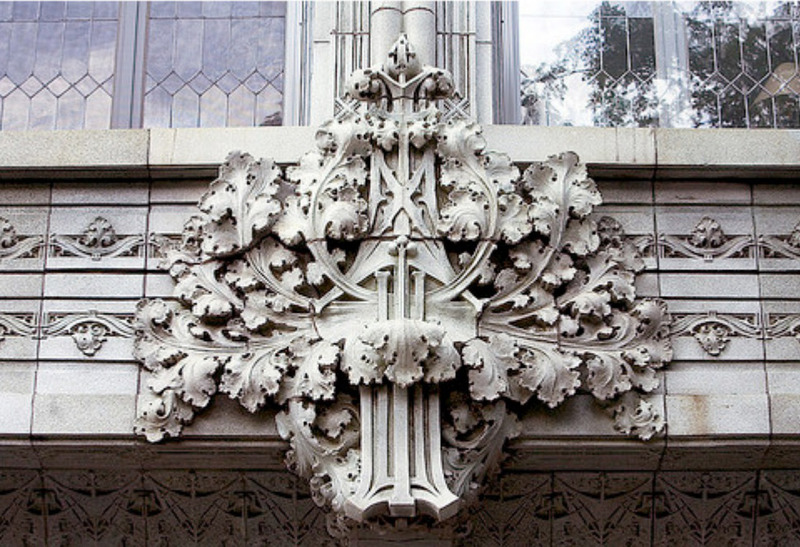 On the outside, architect Ann McGuire and her Evanston firm, McGuire Igleski & Associates, have done fine work restoring the terra cotta, which originally cost just $3,770. Bleached by insensitive acid washing from the 1950’s onward – and thus lighter than its dark green hue – the terra cotta still combines the permanence of granite with the plasticity of clay. New mortar was inserted between the blocks – dark enough to approximate the original mortar, but not so dark that it creates a distracting grid pattern across the facade. Steel behind the facade was repaired, ensuring that the terra cotta won’t spall any time soon. The result is at once sumptuously ornamental and wiseley unsentimental, forging the temptation of making the terra cotta perfect again. “Our task is to preserve what we have, not colorize it,” McGuire said. 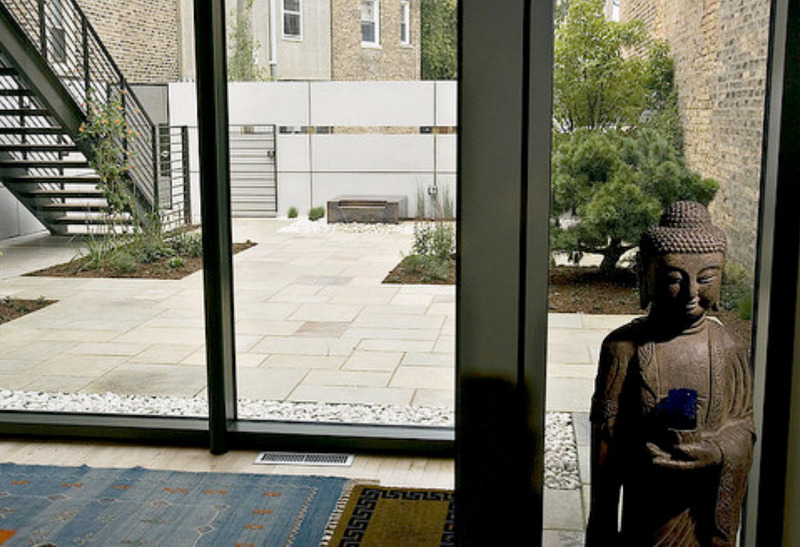 The architects were aided by the careful work of the contractor on the project, Jake Goldberg of Goldberg General Contracting of Chicago. Goldberg had a history with the building. Inside, the Chicago firm of Wheeler Kearns, led by partner Lawrence Kearns and project architect Charlene Young, has brought a mix of intelligence and creativity to the task of shaping Studio V Design offices. Instead of meekly echoing Sullivan’s ornament, they boldly subdivided the interior with a row of yellow synthetic screens that serve as veils and atrium at the back. The atrium pushes outward toward a courtyard, just as the recessed front of the store pushes inward from the street. The light that pours in has a redemptive glow. The old casket elevator has been removed and, out back, and old garage (big enough for a hearse) is gone, along with a makeshift concrete block addition that served as a cold storage warehouse for flowers on their way to the funeral home. A steel stair, a bit austere, has replaced a rickety old wood stair at the back of the building and leads up to the apartment. 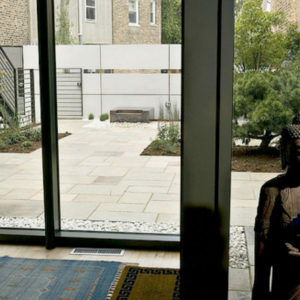 At the center of it all is a serene Japanese garden, where a statue of a Begging Buddha” (now at the back of the building) will sit atop a water feature. It’s appropriate, perhaps, for Sullivan, who late in life relied upon the charity of old friends. On one of its sculpted hands the other day, someone laid a quarter.